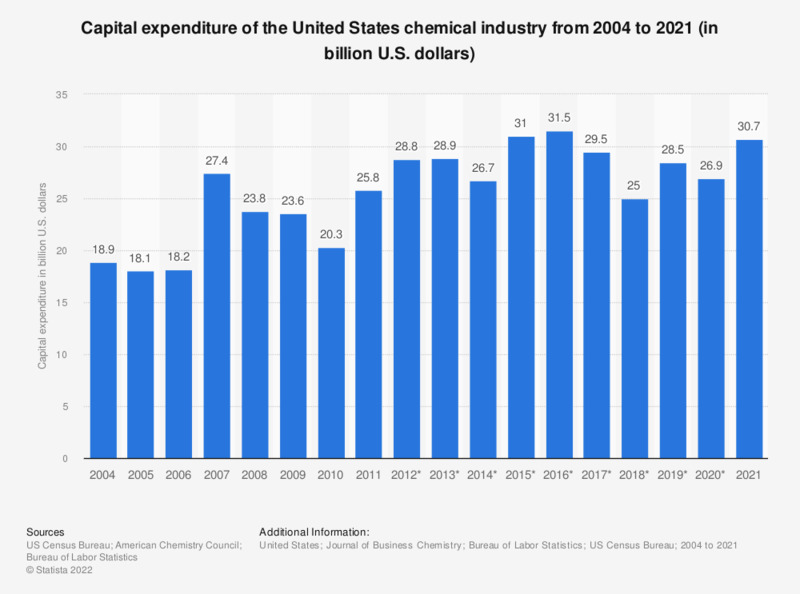 This statistic shows the capital expenditure level for the United States chemical industry from 2004 to 2017. In 2017, the U.S. chemical industry capital expenditure reached approximately 28.7 billion U.S. dollars. * Figures for 2012 through 2017 are rounded to the nearest hundred-million. **In the 2018 edition of the report, the pharmaceutical industry is no longer considered. According to the American Chemistry Council the U.S. chemical industry includes: basic chemicals, specialty chemicals, agriculture chemicals, and consumer products. Everything On "Chemical industry in the United States" in One Document: Edited and Divided into Handy Chapters. Including Detailed References.